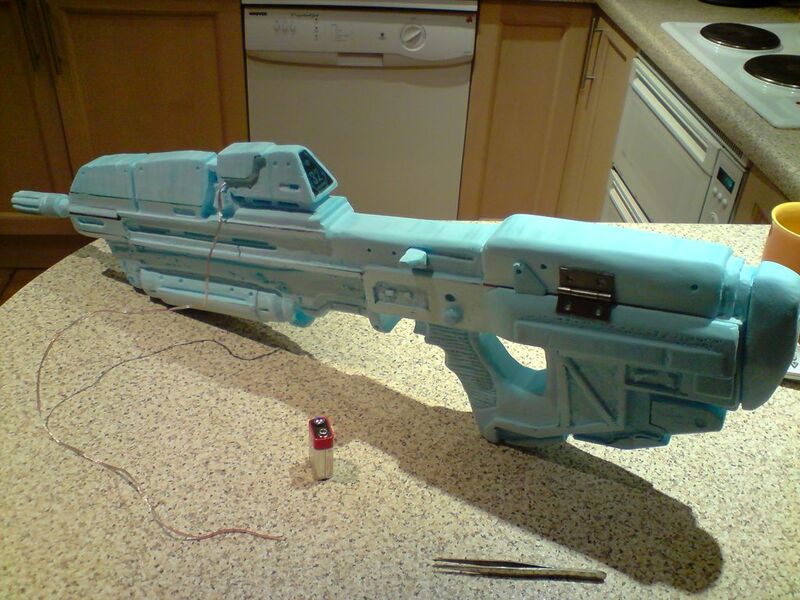 As my first ever instructable, I will be listing the steps I have gone through to produce a foam model "Halo Reach" Assault Rifle. Oh yes, and about 40 hours of free time, maybe less if this guide helps! Also there is a high res render of the rifle for later reference which you may want to print off too. Use the clamp, wire and power supply to create a vertical wire through which you can pass the foam model. My power supply only reaches 30v, 2,5A which gave me a maximum cutting speed of around 1mm/second (Way too slow!) but hey, I managed eventually! Ensure the wire is under tension: I propped up the "arm" with a plastic tub, only removed it for photo purposes. After tracing the template's outside, drill a large hole in the handle gap, thread the hot wire through, and cut that out too. Once the wire is removed again, take the paper template off (Don't throw it away though! ), and you will have something roughly gun shaped. Optional: I also removed the protrusions above and below the barrel to later fit a small 2AA maglite or similar style torch below, and a £1 laser above. If unavailabe, cut around these, not through them! Using the template you removed, draw on the bigger details that will rewuire heavy sculpting. For the upper barrel shroud, I re-fitted the coping saw temporarily with the wire to cut at an angle. For less accessible regions, crack out the 30,000rpm tool! Toward the rear you will need to some of the foam offcuts for the bulky details . This saves having to make the whole thing from an 8cm thick chunk of foam and carving out a helluvalot more foam. Also included is a side by side comparison with a 2D Battle Rifle I made 2 years prior to this model. Sand any rough edges after cutting them, though dont let the barrel shroud's edges become completely round. Hollow out the ammo counter by about an inch for later electronics. Optional: Epoxy a couple of small hinges to the rifle butte for added awesome! I have not fully decided how to store the 9v battery, so I just drilled a thin hole through the ammo counter for the LED wire to pass through so a battery can be held externally (You may wish to cut out a compartment specifically for the battery. The Ammo counter is 2 inkjet pictures sandwiched between 2 acrylic "windows". I cut away the bright blue lines from the back picture so as to make them appear brighter than the background (It's super effective!) I treated myself to a game of invasion to obtain a large screenshot of the display, and edited it out to print it off (Edit is in pics below). You will have to resize it to fit your ammo counter's hole, but 35mm ± 2mm should suffice, so print out 5 varying sizes, and then the correct size again for the back image, and trim the white. Epoxy the front (whole) image face down on the acrylic, and the rear (with lines cut out) image face up on the acryilc, and leave to dry, pressing gently to remove air bubbles. This should give a near perfectly adhered image protected by the acrylic (Sorry for the absence of cut out section pics). Cut the acrylic with the coping saw, leaving about 0.5mm around the edge of each, then epoxy the two together (The paper sides) and sand sown edges onse dried. Check pics if uncertain. When assembled the display will fit snugly in the recess, and the led shines brightly through the cut sections especially, giving an x-ray or lcd effect to the darker areas. Remove the display and wires for the next stage....... painting! Apply a dark grey base coat to all the indents and grooves. It was not necessary to paint the whole thing, or even most as I did. Make sure it is dust free before painting, and mix enough paint to complete it in one go (Mixing the same shade next day is rather difficult, but for this I used about 50/50 black and white) and remove any dried paint from the pallette (Or plastic lid if you use whatever's closest for mixing! ), as this may wear away and ruin the next paint job: Leaving small flecks of paint in the next session. Next is the lighter shade of gray. I used about 3-4 parts white to 1 part black due to the black's extreme darkness, and the shade should look like what 50% opacity black would be on a pc monitor (Opposed to 80% for the base coat). As shown on the digital render, paint a yelow stripe over the barrel shroud. I used masking tape to get a clean edge, alyhough you no not always have to paint to the edges, giving it a worn effect. To further enhance the appearance of wear, use a dry brush with a very small amount of silver acrylic paint, and bruch in quick stokes perpendicular to the protruding verticies and edges. I dabbed the end of the brush in a tiny amount of silver acrylic, and brushed a plastic lid several times to avoid over colouring it. Optional: Use a stencil to apply logos such as the UNSC emblem. Once your paint job is complete, you can use a clear varnish to protect the paint and give it more of a matte look. Be sure to test the varnish on scraps of foam and acrylic paint, or you may end up dissolving your hard work (I decided against varnish as they all seemed to blur or dissolve the acrylic paint to a small extent)! This is the finished product (Without the logos). As you can see in some of the pictures, I still have no permenant place for the 9v battery, and resorted to blutack and discreetly pressing the wires across the terminals! That pretty much wraps up this instructable, and I hope this helps anyone else planning on making their own foam model. Thanks for reading, and don't forget to comment! Months later, I finally decided to add a less unwieldy solution for providing the LED with power. Before, I just pressed the 9v battery against the long wire protruding from the ammo counter, but I did not want to go to the effort of cutting out a slot for the battery, reattaching wires, and painting over them. Instead, I used several of the components I bought from ebay to go in my JFO helmet (Yes... I am infact making a full set of fibreglass armour over on 405th). It was a simple hour-long job of cutting the wire short, and using some spare connectors to fix a detachable battery pack onto the side. One more question, how sturdy is this? Pretty strong. It would probably break if it was rested on both ends and something like a medium sized dog jumped on the middle though. You can always reinforce it by putting a wooden dowel right down the middle though. I am a 12 year old with a limited budget, how could I make this for cheap? I'm starting to think all these newly created accounts are the same person! tip: hide the battery in the magazine. Heya! This is awesome, a great prop. One question, is it possible to make the Magazine detachable to give it that extra feel to it or is it more hassle than it's worth? Thanks! It depends what you make it from really. I could have easily cut off the protruding part that forms bottom of the magazine and used a long kitchen knife to cut a rectangle that went in 5-10cm inside the model, then a horizontal cut to release the top of that polystyrene "block", then glued the two pieces back together. The horizontal cut line could be easily covered up with the foam details that go above the magazine on each side. I've also seen it done with moulded fibreglass models, but since that is hollow , you'd need to spend more time making a box for the mag to slide into. I've seen a couple that used magnets to hold the mag in place, and presumably give an audible "click". Whatever you decide to make it from, a detachable magazine should only add an hour or two to the total build time, so it can't hurt to include it. You could even turn it into something useful like a 4x AA battery holder to power the backlight. Did you brush or spray paint it on? I'd actually doldered a small SPDT switch to the front of the 9v battery holderso it can be turned on and off without removing the battery. I didn't feel it was reallt worth the time to make an internal battery pack, since this was a low-ish quality first attempt. yes... but will it blend? Most certainly! Did you know Costa coffee uses Blend-Tec Blenders?